Of course, as Mama always said, "It ain't much good tellin 'em what you don't want if your not gonna tell 'em what you do". (Editors note: My Mom doesn't really talk like that. She's British, not Forrest Gump.) In the spirit of helpfulness for my family though, who might be struggling trying to figure out what to get me for Christmas, I thought that I would rewrite the 12 days of Christmas, filled with travel related things that I think would make great gifts for me. 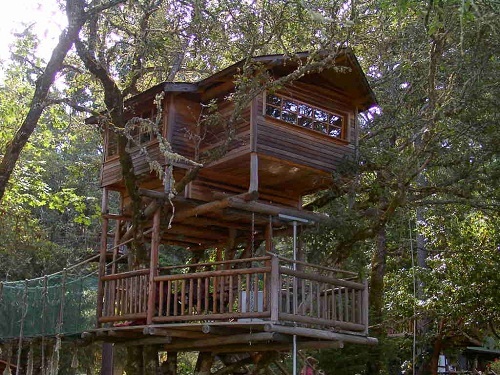 This is from the Out 'n' About Treehouse Treesort in Takilma, Oregon. We all know that my family isn't going camping again, but I think I could muster up some enthusiasm among the troops to spend the night in a place like this. Or one of their other similar treehouses. They have plenty to choose from, including some that are almost 40 feet off the ground. I'd probably prefer something a little lower, but hey, I'm just receiving the gift. I won't be picky. Any night in a treehouse will do. See how easy this is? I'll now pause for a bit so that my family (or any of you who feel sufficiently motivated) can run out and arrange for my first day of Christmas gift, but when you come back tomorrow, we'll look at the second day of Christmas.